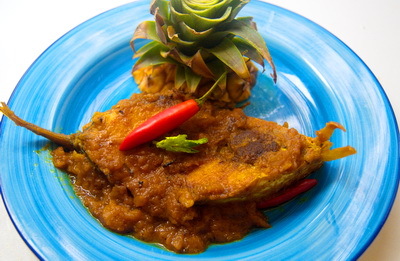 Pineapple Hilsa / Anarosh Ilish is a sweet sour dish. If your pineapple is sour, add bit sugar. I fry the fish before, as you know it is hard to get fresh Hilsa in abroad. I f you have fresh fish, you can skip this. 1. Mix the fish pieces with ½ teaspoon salt and turmeric powder. 2. Heat a pan with oil and fry the fish pieces for 1-2minutes to just seal it. Set aside the fried fish pieces. 3. Now in the same pan add onion and bay leaf; fry it till onion becomes transparent. Add pineapple pastes and red chilli powder and salt and cook it 3-4 minutes. 4. Add 1 cup of water and let it comes to boiling point. 5. Add fish pieces and green chillies. Cook it about 7-8 minutes under closed lid or till the water dries up and you get your desire gravy thickness. 6. Check the salt and add roasted cumin powder. Remove pan from heat. 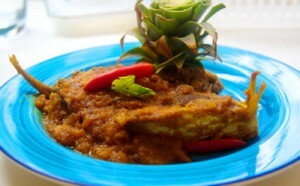 Can I cook any other fish,like Ruhi with this recipe? Plz let me know asap. You can make with any white fish. ruhi will be fine . Thanks.